A Guide To Tumors In Dog Eyes. Includes Symptoms Diagnosis and Treatment Options. Dog Eyelid Tumor: These are the most commonly occurring eye tumors in dogs. Around 60% of canine eyelid tumors occur in the meibomian gland of the eyelids. These are usually adenomas (a benign tumor) or adenocarcinomas (a malignant tumor) in nature. Other types of eyelid tumors in dogs may be adenocarcinomas of the sebaceous glands in the base of the eyelashes, histiocytomas, papillomas and mastocytomas. Eye tumors in dogs which occur on eyelids usually cause irritation, discomfort and an obstruction in eye function, thus they are always treated surgically. Complete excision of adenomas and adenocarcinomas has been proven to be the only effective treatment. Adenocarcinomas and melanomas at the eyelid margins may appear as a spreading mass and can cause discoloration. This represents a severe malignancy which requires rigorous excision surgery for complete recovery. Eye Orbital Tumor in Dog: Eye orbital tumors in dogs cause an eye protrusion in a forward direction, causing exophthalmia (eyeball protusion). The dog eyelids and conjunctiva becomes swollen and due to the severity of the condition keratitis (inflammation of the cornea) may occur. A pressure is progressively generated on the surface of the eye and the eye ball, causing severe congestion behind the eye. The affected eye globe fails to move in tandem with the other eye, thus complications in eye function is noticed. Even though an eye orbital tumor in dogs is causing pressure, surprisingly pain in any part of the eye is not a clinical feature of this condition. This sign, the absence of dog eye pain, is sometime considered as a differential symptom during diagnosis. Dog eye orbital tumors are mostly malignant in nature and with rapid clinical pathogenesis (fast spreading). It affects almost all parts of the bony eye orbital structure, thus the prognosis for this type of eye tumor in dog is always poor. 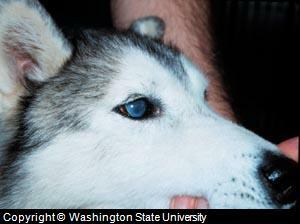 To improve chances of survival, treatment is done with dog eye removal. Corneal Eye Tumor Dog: These are most uncommon types of dog eye tumors, but may occur in deeper corneal tissues and over the surface of the cornea. These occur mostly on the surface of the cornea and are often confused with canine keratoconjunctivits and nodular fasciitis in some prone breeds such as collies. Therefore, a confirmatory diagnosis is always recommended for dogs with corneal problems. A superficial corneal eye tumor in dog are treated with laser photocoagulation, sclear grafts or cryopathy, but for mature and penetrated tumors, enucleation or removal of the dog eye ball only is required. Uveal Eye Tumor Dog: Dog eye melanoma or uvea tumors are another common form of malignant tumors, which are related to the dog eye pigment cells (excluding retinal pigment cells). This type of eye tumor in dog originates from melanocytes of the uvea, which resides in the iris, lens and ciliary bodies. Changes in dog eye pigmentation (darkened or pink), glaucoma, hyphema (increased redness), and an obvious mass on the iris and the associated ciliary body are common indications of malignant melanomas in dogs. Venereal canine eye tumors and heamngiosarcomas are other types of uveal tumors in dogs, which spreads up to it and causes cancerous developments in both of the dog eyes. 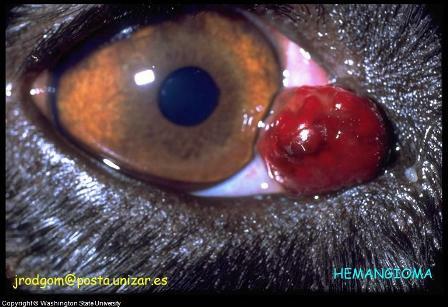 Both medical and surgical treatment plans are followed for uveal eye tumor in dog conditions. A dogs clinical history and a thorough ophthalmic examination are the initial steps towards diagnosis. Different approaches during clinical examination are followed, depending upon the status of the condition, which varies dog to dog. Dog eye tumors can hardly be confirmed through clinical examination alone, therefore different laboratory and radiographic procedures such as biopsy, basic eye tests, X-Rays, ultrasonography etc. are done for confirmation. In the case of malignant or secondarily spreading eye tumors in dogs, detailed body tests such as blood profiling, examination and biopsy is required to confirm underlying primary cancerous developments in the body. Treatment is varies according to the type of canine eye tumor, status of the condition, the severity of symptoms and chronicity (severity of the dog eye disease). Superficial canine eye tumors that occur over the corneal surface and eyelids can easily be treated with the help of radiation. Surgery is most common and effective treatment plan for most dog eye tumors. Both the benign and malignant types of eye tumors in dogs usually require surgical excision, so that further cancerous developments can be halted. General surgery and cryosurgery (exposure of eye tissues to extreme cold) in combination with other approaches such as medical and radiative approaches are effective modes of treating eye tumor in dog. Therapeutics such as high doses of local and general non steroidal anti inflammatory drugs (NSAIDS) and anti cancerous drugs can specifically help to reduce symptoms and the development of cancerous tissues. NSAIDS are more commonly used for malignant and uveal tumors or for those tumors which spreads to the eye from other parts of the body. Supportive care and the use of remedies such as supplements, natural extracts and regular cleaning can help to reduce the severity of symptoms and the effect of cancerous/tumorous developments over the general physiology (health status) of the body and eye. Two natural products that may be of help include C-Caps which is a natural antioxidant used for support to physiology and excretion of toxins and Eye Heal, for eye health support.